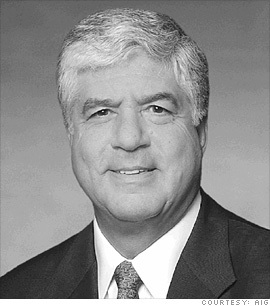 AIG's new chief executive Robert Benmosche had a rep for shooting from the hip before he was hired to lead the bailed-out insurer in August, and it didn't take him long to start taking shots. In his first meeting with AIG employees, Benmosche called Congress a bunch of "crazies," saying he would tell them to "stick it where the sun don't shine" if he was called to testify on Capitol Hill. He also announced that New York Attorney General Andrew Cuomo, who had been investigating AIG, "doesn't deserve to be in government." Benmosche didn't stop with the barbs. After board members tried to rein him in, he asked for a private jet for personal use and later threatened to quit over government-prescribed pay restrictions. It's not easy to feel sympathy for politicians, regulators and overpaid corporate board members, but Benmosche is doing his best to make them look good.